On Wednesday my research group, Deepwater, along with the lemon shark research group set out to have our fun field day. It was our last field day of the entire semester and we were all excited to do something exciting. We all arrive at the boathouse, ready to go when our research advisors tell us we are doing something completely horrible: hand hauling. Now, here is some explanation of what that is. 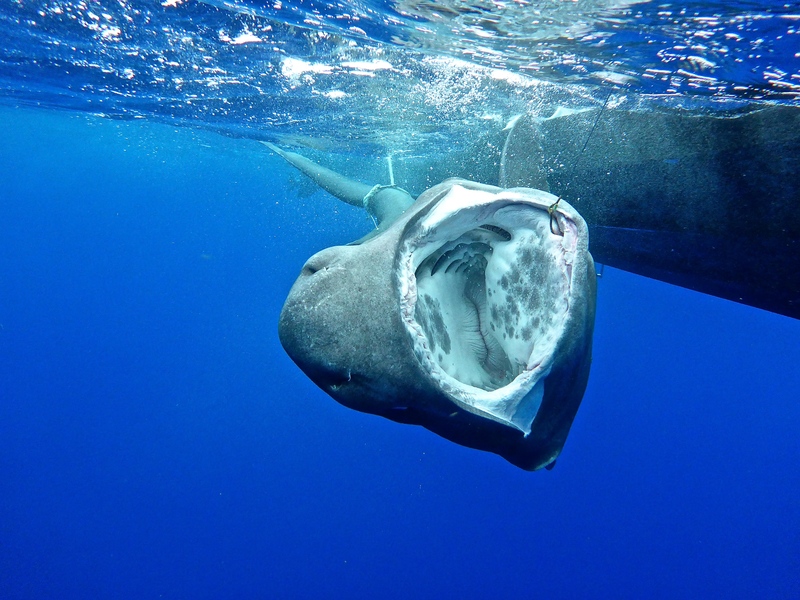 In deepwater research, a series of traps were dropped to depths between 500 and 1200 meters. To haul these traps to the surface, we use an electric pot hauler. But when that breaks, there is 1000+ meters of line to hand haul, and that is what our research advisors told us we were doing on what was supposed to be our fun field day. We all hop on the boats, two pangas, and begin driving to the oceanic shelf in the Exuma Sound, which is what we use as a proxy for depth in deepwater research. As we drive out, we see our buoys and begin to hand haul. After about 2/3 of the line is hauled and coiled into a bucket, our advisors gather us together and tell us that they in fact did not drop regular traps, they dropped a deepwater scientific long line!! A long line consists of a series of baited hooks (our long line had 29 hooks), which are meant to catch animals such as sharks. 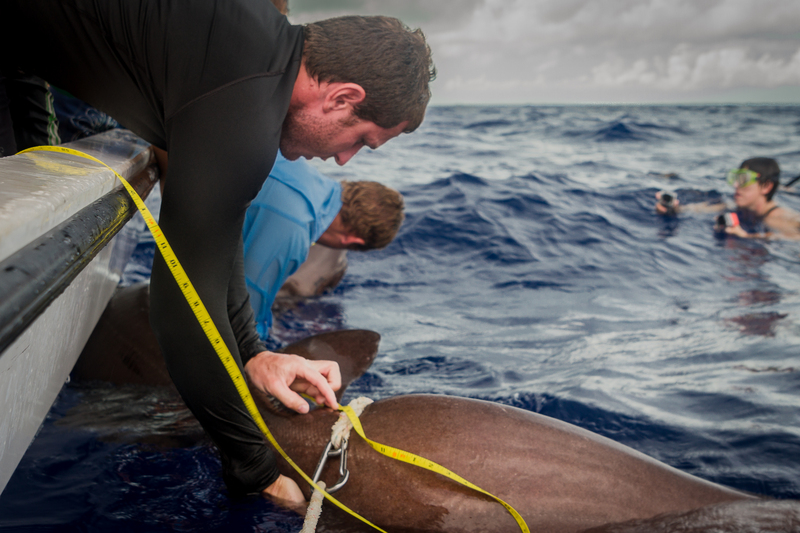 Species like a gulper shark and Cuban Dogfish are common deepwater sharks that researchers here have pulled up. I heard our teachers say that we could go in the water and I immediately leaped in with all the other students. I could see the hooks in the water – nothing so far. I keep staring, hoping that soon I would see something. Jeff, one of our teachers, comes up from a free dive and gives a thumbs up. There is something on the line. I can slowly see an outline of a shark appearing, getting larger and larger till it reaches the surface and in front of me is a 10+ foot Blunt Nose Six-Gill shark. Right in front of me. All the students take their cameras to capture this moment. 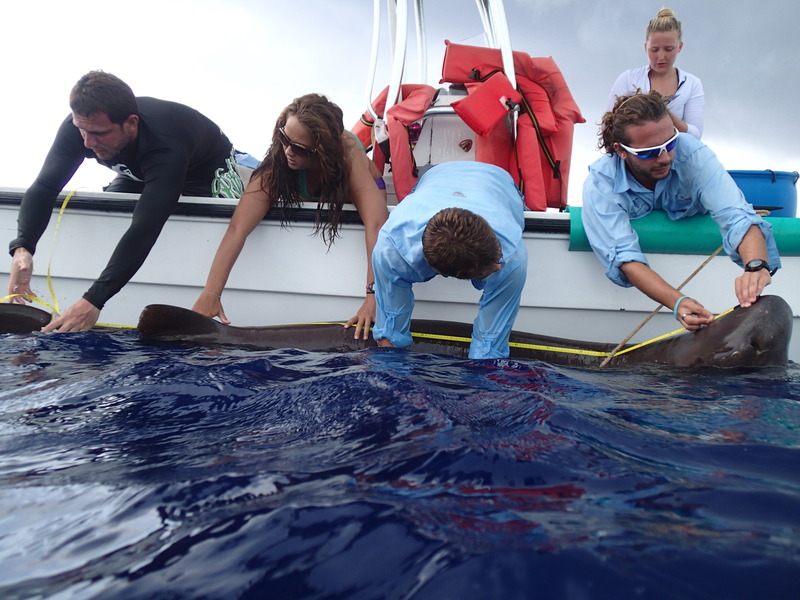 Our teachers tie the shark to the side of the boat so that it lays half in the water, half out. 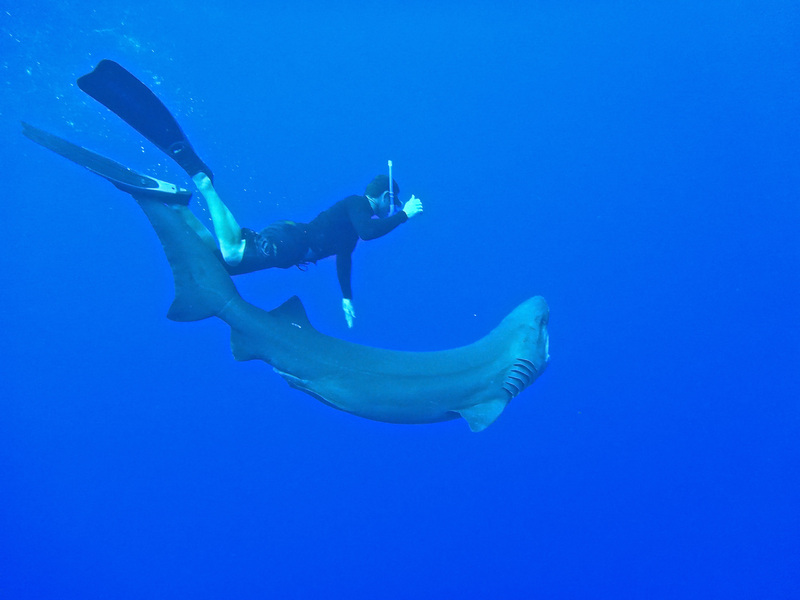 This was not difficult because the shark is completely disoriented, as it is not in its own habitat. 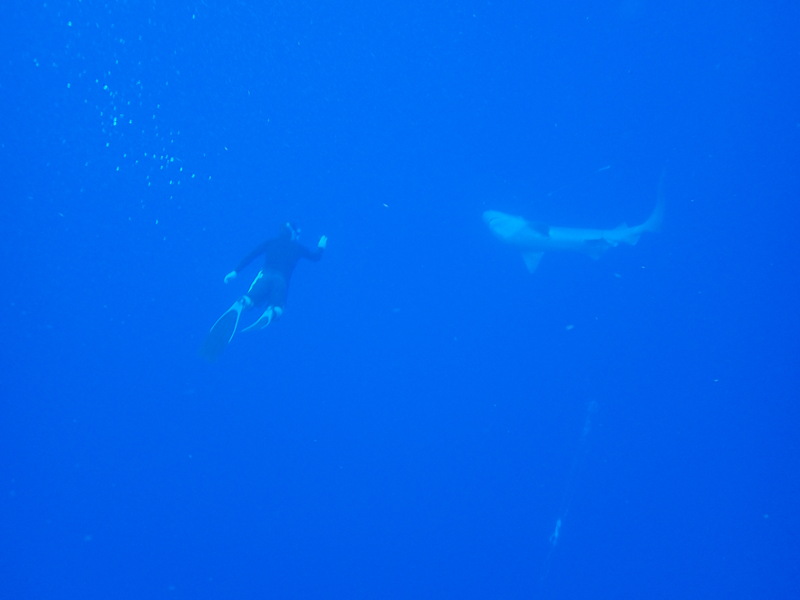 The shark we pulled up is from 760meters deep and being at the surface, or even in shallow waters, confuses all the senses of the shark. 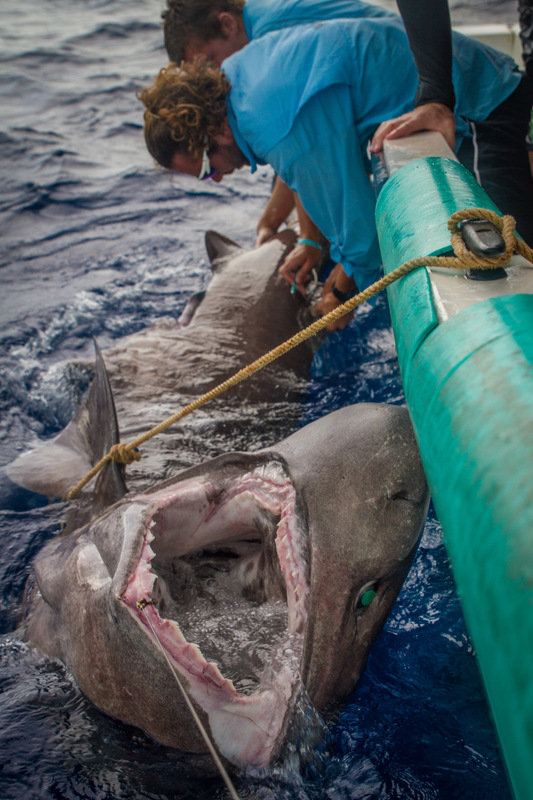 In addition, the shark had been hooked for several hours and after being pulled out of its habitat, was extremely stressed. It did not have the drive to fight because all its energy would be primarily placed in trying to protect itself in survival. 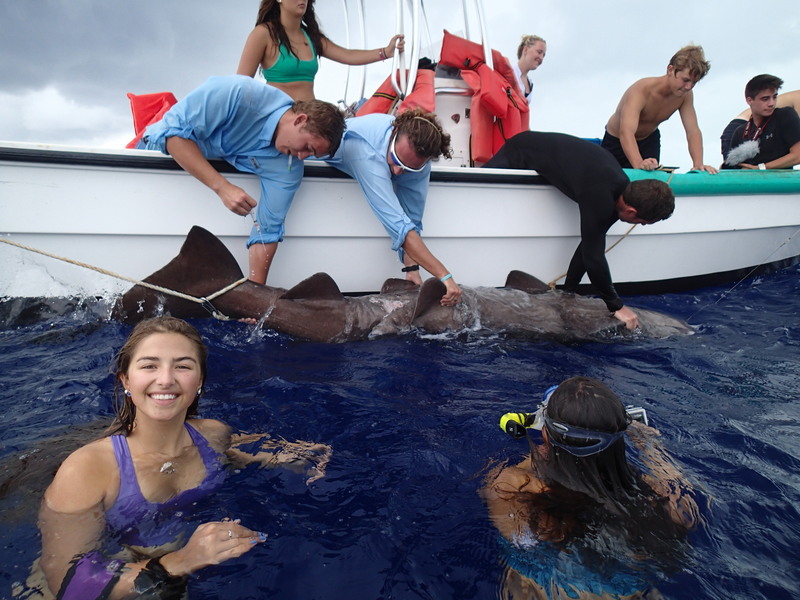 They begin to take measurements and samples from the shark while all the rest of us sit in the water and watch in amazement. 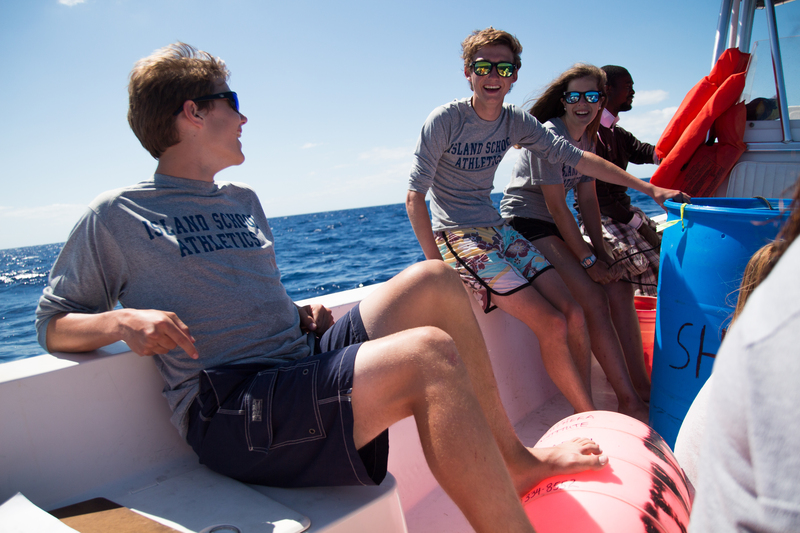 It was the first time any of us, the students that is, had seen a shark anything over 4feet. 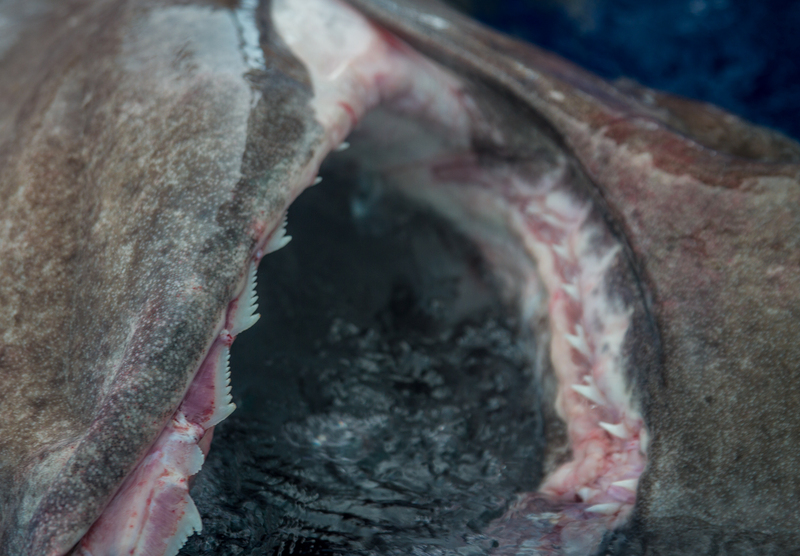 I am still in amazement that we caught a blunt nose six gill shark. I was able to see its gills flap in the water, its mouth open to show off its numerous teeth. The body swaying side to side as Jeff swam it back down and then let it swim free back down to its home of 760meters deep. I watched it until it disappeared into the navy blue, by which time we all had to hop on the boats and head back to campus. By far the best experience of my life.